The Honeymoon Ritual is the last and probably the most unnecessary ritual of the wedding extravaganza! I have seen a LOT of couples actually delaying their wedding dates so that coincide with a more favourable time to travel. Dates have been pushed back and forth trying to accommodate a ‘so-called’ honeymoon budget. The idea of a honeymoon or to simply put ‘a post-wedding holiday’ was to give the married couple some space and time to understand and get accustomed to each other in their respective living spaces before actually starting a life together. With time, the notion has evolved and spouses are usually more relaxed with each other by the time they are married. The Honeymoon Ritual, however, refuses to evolve! Now the idea of a honeymoon is so done to death, that it revolves around the frantic search for an exotic location that very little people in your Facebook friend’s list have been to. And it has to be some place exotic because when you tag yourself there with your new spouse, you have to garner at least a 100 reactions on social media. Otherwise, you are not doing honeymoon right. To each, their own. I agree. But when people (read married people) judge you and your marriage based on your honeymoon destination, that gets to me. You may have worked this out by now but yes, I never did a honeymoon. My husband and I chose to stay put and rejoin work as soon as the wedding festivities were over. Let me straighten one thing out though. I am all for the holiday! I mean, who does not like a vacation. But the idea of a fully loaded honeymoon was just too much for us to handle and we did away with it. Instead, we jumped head on into life, making fortnightly weekend getaways a more frequent habit. If only, people (read married people) left us alone! Months into the marriage, they still rant on about how I missed an opportunity to have fun for once in my life, especially with the baby on its way. So wait, you are questioning my ability to cope with a honeymoon-less life and are also telling me very slyly that my life ‘with the baby and a husband’ will be bonkers? My God! Opportunity lost? Not. And here is why! First, personally spending thousands, lakhs even, on a glorified holiday is just not acceptable to me. Call me stingy, but when every honeymoon-related package comes to you at 250% more than it’s original cost, I would rather be home watching random Kung-fu movies with a husband who loves the television as much as I do. Second, there is no dearth of chemistry and magic in our marriage. I have burnt more meals in the kitchen than anyone has and we have been getting more takeaways from restaurants and eating them in solitary confinement watching Modern Family re-runs, just the two of us. That, right there, is our honeymoon. and Third, it is totally a personal choice! 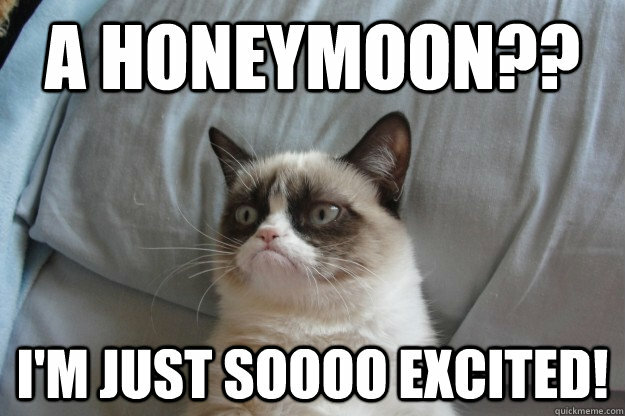 I am not taking a dig at honeymooners in general, party all you want, I could not be happier for you. But it is the sympathisers that need to back off a little. Next time before you go all googly-sympathetic faced for someone who haven’t had their honeymoon, restrain yourself. They have their reasons. Heck, they may even be smarter than you think. And NO, a missed honeymoon is not a lost opportunity. It is just another wedding ritual some of us decided to skip. Previous postBring back in trend, the lost art of spelling correctly! Next post#TrendAlert : Chokers and How to style them!